Dr. Michael Snell will be the principal engineer and designer of your solar system and will be directly involved in your systems entire installation. With degrees in Nuclear Engineering and Physics, Dr. Snell has a 30-year background in alternative energies and high-tech research. He was a physics professor at the United States Air Force Academy while serving as a military officer during 12 years of active duty. Mike is still a Major in the Air Force Reserves. After a career of directing research programs for the Departments of Defense and Homeland Security, Dr. Snell is now focusing on a long-time passion in alternative energy and renewable resources. 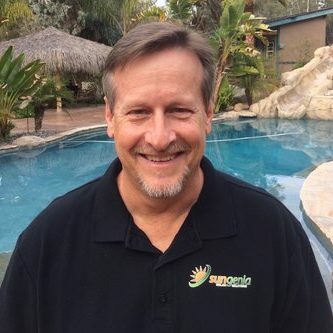 Mike continues to attend seminars, industry trade shows, and is completely up-to-date on the latest technologies, regulations, code requirements, and utility changes in the solar industry. He also enjoys golf and playing softball with his family.